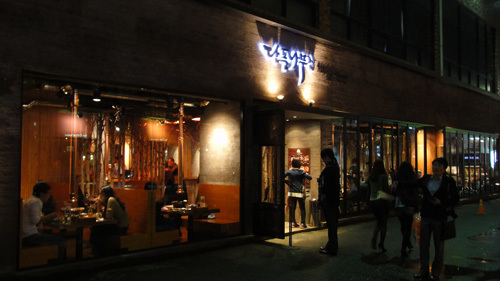 at the beginning of the alley, you’ve noticed the Korean modern grill with the long wide windows . I’ll let you on a secret, but understand that I will have to kill you afterwards .. just kidding . but instead of walking all around the right side of Hamilton Hotel : just enter the hotel main lobby, go straight ’til the end and go up the stairs and voila ! you are there . what confuses first-time visitors through this maze is that actually Hamilton Hotel lobby goes through underneath the alley BEHIND the hotel and up to their Buffet Restaurant and Wedding Hall, which is located in the alley behind the hotel . 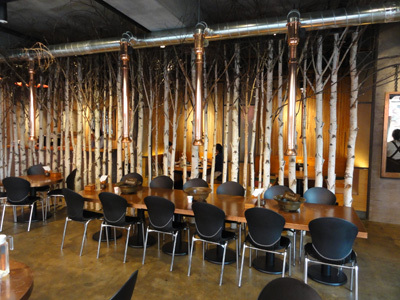 and this same entrance is connected to DanPoong Jib loosely translates as “Maple Tree House”. actually this is a branch of their main traditional Korean pork grill-house up North in the old downtown area of the Capital of Seoul . a scary area in the days of military dictators for it is the road from the American Embassy aside KyungBok Palace and up the mountain towards Presidential Blue House – or put it romanically the dating course in the old days for 3 ancient palaces are located in this area . the old restaurant is refurbished from a classic Korean-style housing and known for grilled pork . 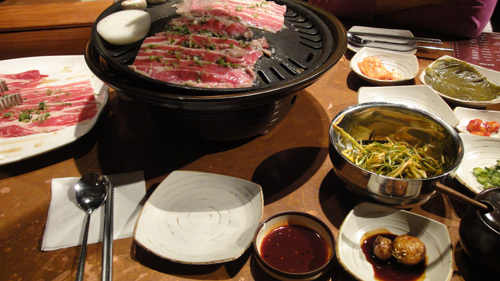 however the iTaewon branch is more modern in design and clean – I say this for traditional Korean barbecue restaurants are dirty, and deemed more tasteful if it is so – offering more variety in grill meat and dishes, more modern, fusion and geared for Western appetite – as compared to those attracting Japanese and Chinese tourists . it really is a pleasure trying to make up your mind from their wide array of menu, or choice in meat . but my favourite over is the bacon-style meat frozen at onset and melts as you put it on fire, then dip it on a tastey sweet pepper-and-soy sauce .